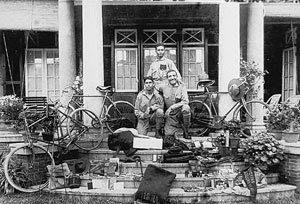 Geared to go: Hakim, Bhumgara (standing) and Bapasola with their paraphernalia before the tour. Long before the sun had peeped above the horizon on 7 August 1924, the last traces of old Damascus had faded from our view. Our objective now was Jerusalem, which lay 190 miles from Damascus. The road connecting these two centres on the whole is well metalled, save some miles of very rough track. By mid-day we had traversed 41 miles and arrived at El Kuneitra in time for lunch. El Kuneitra is a pleasant town populated mainly by Circassians. We were taken to a police station and our passports were examined and endorsed as we were now leaving the province of Syria. While we were at Damascus an account of our enterprise had appeared in a local newspaper. The commissioner of police at El Kuneitra had read the same and on our arrival invited us to stay with him for a day. Of all things, time was the last thing we could spare. We declined his invitation with many thanks and after lunch and tea with him took to road at three in the afternoon. With the sun beating down upon our unsheltered heads mercilessly, it was with difficulty that we negotiated the ascents which we encountered on leaving El Kuneitra. We were not in luck however. When the descent commenced, we found the track very rough, strewn with stones of no mean sizes and it was a hard task to prevent our machines from bumping against one stone in trying to avoid unpleasant contact with another. The track grew worse and worse. Finally, we dismounted and walked; even then one or the other would put his foot on an apparently firmly-embeded stone, only to find himself lying on the ground, with the machine and baggage performing similar stunt. We crossed a river bridge; this is the boundary line separating Syria from Palestine. We were accosted here by policemen who noted down all our details and only then permitted us to proceed. This place is called Jisr Benat Yakub, meaning ‘Bridge of the Daughters of Jacob’. It derives its curious name either from the traditional belief that Jacob once crossed the river Jordon at this spot, or perhaps from the fact that a number of Jacobian nuns were put to sword during the Crusades. A little distance from this place lies a Jewish Colony where we passed the night. From Jisr Benat Yakub, Tiberias, on the sea of Gallillee, is 24 miles. The mid-day sun had not yet attained its zenith in the sky when we found ourselves listening to the music of the waves of the sea munching our rude fare. A time there was when the shores of this lake were hemmed in by busy bustling and thriving towns. Today Tiberias and one or two squalid villages only stand sentinel over the waters of this lake. The Sea of Gallillee is really a lake, measuring 14 miles from north to south and has an average width of 6 miles. It lies 680 ft below the level of the Mediterranean Sea. At its north end, the River Jordan enters through a delta of its own deposit; the river resumes its southerly course and pours its contents into the Dead Sea. It was in the vicinity of the Sea of Gallillee that the Blessed Redeemer opened his career and gave to the world his immortal parables of the lost Sheep and of the net. Of the Sower the Wheat and the Tares, of the Grain of Mustard seed and to the Lilies, which toil not, nor spin. These flowers more glorious than the Soloman glory still abound in the vicinity of this hallowed lake. Almost every town in Palestine has a history. Tiberias is mentioned in the New Testament. Herod Antipas, built the city probably upon the site of the cemetery of Rakkath, some twenty years after the death of Christ. For centuries past this town is noted for its hot water springs. A dip in the Hammam-e-nabi-Slleman, as these springs are called, cost us each about two Egyptian Piasters. The waters of the spring, which maintain a temperature from 130° to 142° Fahr are locally considered an unfailing cure for rheumatism. With Tiberias is also connected a Jewish legend, viz., that when the Messiah arrives, he will emerge from the Lake, collect His people at Tiberias and march triumphantly to Safed ‘where His throne will be established for ever’. Back home: (from left) Hakim, Bapasola and Bhumgara. Leaving Tiberias, that afternoon we had to encounter steep gradients. The uneven nature of this district entails considerable hardships on the travellers. The redeeming feature of the tour through these regions is abundance of fruits. Passing Kefr Kenna en route we arrived at Nazareth. If Kefr Kenna be what many believe it, namely, the true Cana of Gallilee then it was at this place that Lord Jesus performed his first miracle at the marriage feast. Nazareth is too well known throughout Christendom to need any mention in detail. It was at Nazareth that Jesus spent his early days. We find no mention of this place in the Old Testament. When Lord Jesus moved and taught Nazarene was an epithet of derision. We did not tarry long at Nazareth. However, we paid a visit to the renowned Church of the Annunciation situated within the precincts of the Latin Monastery. The building is 69 ft long, 48 ft wide with marble steps on either side leading to the high altar. Below it is the Crypt. From here we reached the Chapel of Angel and the Chapel of Annunciation. Another place of interest in the vicinity of the orthodox Church of Annunciation is a spring the waters of which are conveyed to Ain-Miriam, or Mary’s well. The well undoubtedly is the one frequented by the Virgin. Even today the pretty Nazarene women strut about this place with their pitchers, which they fill from the fountain. We did not stay for more than a couple of hours at Nazareth. A journey of 19 miles brought us to Jenin, a beautiful little town lying between the mountains of Samaria and the Plane of Jazreel, with luxuriant gardens bearing testimony to the fertility of the soil, which is a volcanic decomposition. From here a spiral ascent once again pestered us. We left Nablus, the capital of the Samaria province. Populated mainly by Mohammedans, Nablus is a town with considerable trade looking to its population of 16,000. Two railway lines branch from Nablus. One connects this town with the Lydda Haifa line at Tulkeram and the other with Haifa-Damascus line at Afule. From Nablus onward our uphill journey continued till we arrived at Jerusalem. Throughout the route, grapes, figs, olives, and pomegranates were seen in abundance. Half-a-piaster could buy us figs in incredible quantities. As we proceeded further we could obtain fruits cheaper and cheaper, until all that we had to do was to get them for the mere asking and at several places even without that much trouble. Occasionally an extraordinarily luxuriant bough of grapes tempted us to break our journey and collect a hatful of them. At times, our poaching excursions were challenged by the owner of the vineyard who saw us trespassing upon his property with such impunity. Often we were mistaken for soldiers, a confusion of identity in our favour, for the farmer of the district as a rule is loath to incur the displeasure of the members of the military. More often than not our own invasion of the vineyard was looked upon with indifference as the owner knew he had more of the commodity than he could ever dream of disposing off, and that a handful or two would not diminish the stock at his disposal. On our arrival at Jerusalem we knocked at the gates of Casa Nova, a Franciscan hospice at which travellers and pilgrims find boarding and lodging gratis. At first a friar declined to accommodate us, though in the end we successfully persuaded him to do so. We stayed at Jerusalem for four days. Modern Jerusalem has a population of 63,000 people of which more than half are Jews and the rest almost in equal number Christians and Muslims. The city is divided into four quarters by two intersecting streets, inhabited by four nationalities, viz., the Jewish, the Mohammedan, the Armenian and the Grœco-Frankish. Running right round the city is a wall with an average height of 38 ft, and a length of 2½ miles. The wall is pierced by eight gates, each of which bears a distinct name. In 1917, from under the Crescent, Jerusalem came under the Cross, when General Allenby entered the city. The Holy Sepulchre is undoubtedly the chief centre of attraction in the city. Thousands of pilgrims journey to this place from distant lands to pay their homage at the shrine of the Lord Jesus. To the Christian, the Jew and the Mohammedan the city is an object of profound veneration. In a corner of the city, in the northwest, lie the buildings comprising the Church of the Holy Sepulchre, hidden from gaze by many buildings that cluster round it. The interior is divided into two parts the Rotunda and the Orthodox Cathedral. Within the precincts of the Holy Sepulchre are also the Chapel of St Helena, and Chapel of Invention. Tradition goes that from the spot where the latter Chapel is built, Empress Helena, who received divine direction stood and watched, as three Crosses under her instructions were being excavated. Popular belief is that with the three crosses, nails, a crown of thorns and an inscription bearing the words ‘Jesus of Nazareth, King of the Jews’ were discovered. Bishop Macarius, who was observing the excavations devised an ingenious method of finding out the Cross on which Lord Jesus was crucified. Each cross was taken to an ailing woman. At the touch of the true Cross, its related health and vigour were restored to the sickly woman. We also visited the chapel on Golgotha or Calvary. Here we saw a marble slab with a hole in it, wherein the base of the Cross was inserted. On the right and on the left were similar sockets in which the crosses of the two thieves were planted. Nearby these sockets was the ‘Cleft in the Rock’, 10 inches deep, which tradition goes, was ‘hewn when the veil of the temple was rent twain from the top to the bottom; and the earth did quake and the rocks rent’. On 16 August we left Jerusalem, ‘the city set on a hill’. A journey of 5.5 miles brought us to Bethelhem with its Church of Nativity. The solid building comprising this church lie at the eastern end of the town, and the church is regarded as one of the oldest churches in the world. Beneath the Choir is the cave and the Manger, where Christ was born amidst the rudest surroundings. During our journey from Jerusalem to Beersheba via Hebron, we had done with mountain climbing and were now journeying on a sandy plain. From Beersheba two roads branch off, one going to Gaza, and the other to Khan Unis. We followed the latter road as on enquiries we learned that the track to Khan Unis was hard. Now that we had negotiated and done with mountains for the time being, we found ourselves crossing sandy tracks once again. There is little to choose between a journey across the desert and a journey over a mountain. Halting at a police station at Khan Unis for some time we resumed our journey. Barely a mile was covered when the track was totally obliterated by fine white sand. Our feet sank deep into the sands and our machines left deep trails behind them as we dragged them with great difficulty. To all indications we were now on the verge of another great desert—the Senai. We were cautioned by many well wishers to abandon the project of a journey on cycle through this desert, as before us none had ever succeeded in performing similar feat. We were advised to requisition the aid of the ‘ships of the desert’—camels, for our purpose. We were assured that of the 125 miles of vast sandy stretch not an inch of ground would be hard enough to permit cycling and sure enough it was so. All through the journey we had to pass ankle-deep through a sea of sand. The Senai Military Railway runs between Gaza and Kantara for 155 miles and we moved along the railway track. Necessity is the mother of invention. By now we were tired of dragging our machines and so we devised a plan of rolling them on the rails, with us walking on the sleepers. But this was not very ingenious, as it necessitated a concentration of attention on the cycle wheels and the rails. Directly the eyes were removed from the rails even for a moment our machines would be derailed. It also made impossible for us the appreciation of the landscape. Anyway this was not a real grievance. What could any one have to see in the barren desert except sand and a merciless sun. Miles after miles we walked looking at the wheel and rails, and the rails and the wheels, till our necks ached. We arrived at Rafa in the evening. Rafa produces a rich crop of watermelons, which are consigned from here to Port Said and Suez. About two miles from Rafa lies the boundary station between Palestine and Egypt. When therefore we entered Rafa we left behind the Continent of Asia and set on foot over the Dark Continent. Rafa means in Hebrew a giant and according to Second Book of Samuel this place was colonized by giants. Be that as it may, we left Rafa the next day at dawn. As we were following the railroad, we resumed our usual practice of securing from the various stationmasters’ declaration that we did not travel by train any portion of our journey. 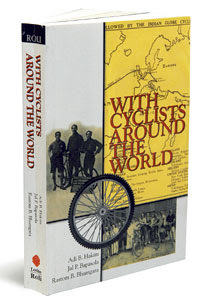 With Cyclists Around the World: By Adi B. Hakim, Jal P. Bapasola and Rustom B. Bhumgara, Roli Books, 376 pages, Rs350. There is little of interest to be seen in the Senai Desert. We came across the carcass of camels, lying half embedded in the white sand, relics of some dumb creatures, perhaps slain to solve the problem of water in the desert. They bore adequate testimony to risk both man and animal alike ran in their journey. From Rafa we came to El Arish and then proceeded to Maaden. Before we reached Maaden, we were caught in a sand storm. By the time we emerged from the storm, which fortunately for us was of short duration, we were powdered from top to toe with sand. We retraced our last route with difficulty and proceeded. When weather is very rough, even camels find it difficult to make any headway. These poor beasts of burden turn round every now and then as a blast of wind sweeps into their unprotected eyes and nostrils, the piercing sand of the desert. Then once again they turn round and proceed on their irksome journey. Even the native Bedouine— born and brought up in the desert—is seen walking along the railroad and shunning the interior, when the risk of being lost in the sand dunes is very great. En route we passed railway stations, which had been closed for want of traffic or trade. We passed Mazar, walking and leading our bikes of course with our eyes stuck fast to the rails. We passed El Abd with our eyes still glued to the rails. Romani was passed and yet our eyes could not be removed from the rails. Only a few miles from the Kantara East we got good metalled road. That afternoon in Kantara we halted at a shopkeeper’s place. Kantara occupies a strategic position midway on the Suez Canal. In the last World War many a glorious encounter was fought for the possession of this point of vantage. Even today the travellers find relic of the last war scattered over the shell-torn area. Bhumgara took a dip into the Suez Canal, swimming the distance between Kantara East and Kantara West. The cycles were transported by a ferry to the opposite shore. At the Egyptian Customs House of Kantara West, a duty of half-a-pound was levied on our machines on which a seal of the Customs Authority was affixed. We were told we would be entitled to a refund of the duty if within six months of our entry we left the country with our bikes. The seals affixed were for identification of the machines. This seal is to be valued at half-a-pound; you smash the seal in a fall and your half-pound disappears instantly into the government treasury. …Leaving Kantara, on 24 August in the early hour of the morning, we succeeded in covering 115 miles, the distance from Kantara to Cairo in the course of one day. It was not, however, without considerable difficulty. The road from Kantara to Ismalia is devoid of vegetation and at times degenerates into sandy patches over which cycling is impossible. From Ismalia to Cairo the whole region displays green and luxuriant crops. By the time we rested at Bilbeio for the afternoon we had covered 73 miles. A ride of 39 miles from our last halting place brought us to Cairo even while the sun lingered on the horizon as if waiting to congratulate us on our record run. As we entered Cairo, we were greeted with a din and clatter characteristic of a huge metropolis. Cairo, the Egyptian metropolis was humming with throng and activities. The honk of the cars, the hum of the tramcars, the creaking of the cart wheels, the none too polite language of the hack-victoria driver when he finds his progress impeded, the brawls at toddy shops—all vest Cairo with a marked resemblance to Bombay. In fact the localities of Bombay seemed transplanted here. With its population of 800,000, Cairo is a city that outrivals Bombay in many respects, though commerce and industry of this place sink into insignificance before those of Bombay. Cairo is clean and free from one ugly feature that mars all appearance of cleanliness in Bombay. Two systems of tramcars ply in the streets of Cairo. Tramcars bearing resemblance to those in Bombay but with three classes run in the streets of the city proper. The system of tramcars, designated as metro-tram, locally, serves the needs of suburban population. Outside the city, these cars attain considerable velocity and ply over a distance of 15 miles. Fares are charged according to distances. During our stay at Cairo for a week we paid a visit to the Egyptian museum, the Zoological gardens, and the world-renowned pyramids, which rank not without justification, as one of the Wonders of the World. The visit to the Egyptian museum is more than worth the trouble. Here you find ‘mummies’ or embalmed bodies of ancient kings and celebrities. The mummies are an object of gruesome interest and they fascinate imagination. One shudders to recall that many of these relics of human organisms which once in dim distant ages moved about with all the pomp and glory, not content with continent-wide kingdoms, now rest content with six feet of stone casing. Despite the undoubtedly great antiquity of these mummies one sees the nails on the finger, the hair on the head and teeth in good condition. Age has shrivelled up the frame but the shrunk human structure conveys faithful representation of what it must have been when alive. It is not only in Egypt that you find mummies. They have been discovered in Persia, Peru and Mexico too. 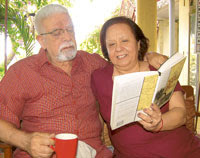 Gen next: The son and daughter-in-law of Adi B. Hakim, Vadodara-based Dara Hakim, 73, and his wife, Roda, 63. Dara Hakim’s father was not one to boast about or even dwell on the epic journey he, along with his companions, had undertaken as a young man. Only after much goading by Dara and his six younger brothers would Adi Hakim occasionally regale them with an anecdote or two. Usually, they were exhorted to go and “have adventures of their own”. 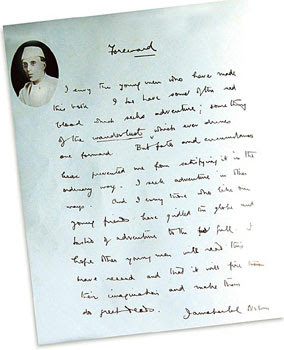 Dara attributes his father’s reserve and modesty to his humble background. Like his fellow adventurers, whom he first met at the Bombay Weightlifting Club, Adi Hakim came from a solid middle-class background. Nevertheless, Dara had always nursed the desire to see ‘With Cyclists Around the World’ in print again. Fortunately for him, his wife Roda shared his enthusiasm. His first attempt was to contact Khushwant Singh, then the redoubtable editor of the ‘The Illustrated Weekly of India’, in the late 1970s. He got no encouragement whatsoever. The book, Dara was told, would be of little interest to anyone. Some years later, Roda and he were surprised to see photos and an excerpt from ‘With Cyclists…’ in a book commemorating Asiad 82, the Asian Games which were held in New Delhi in 1982. Some more years passed. 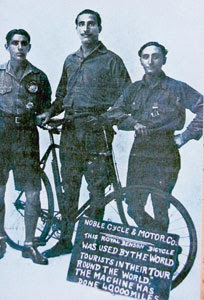 Then, one day, Roda happened to show the fragile old copy of ‘With Cyclists…’ to her friend, the novelist Esther David. David read the book and couldn’t imagine this bit of valuable history being consigned to oblivion. She gave Roda a list of publishers to contact. They all said it was a wonderful book but, for one reason or another, didn’t say much beyond that. Roda’s persistence paid off when the Delhi-based Roli Books decided to bring it out again.